As an excellent DRM M4V converter, M4V Converter Plus can help you legally remove DRM from M4V video files that bought from iTunes store and convert DRM M4V files to common video format files with high quality and fast conversion speed. If you want to convert DRM M4V videos to unprotected MOV format and then play on iPod / iPhone, please read the following steps. Quick guide to convert M4V to MOV with the same quality. Step 1: Select M4V movies you want to convert. 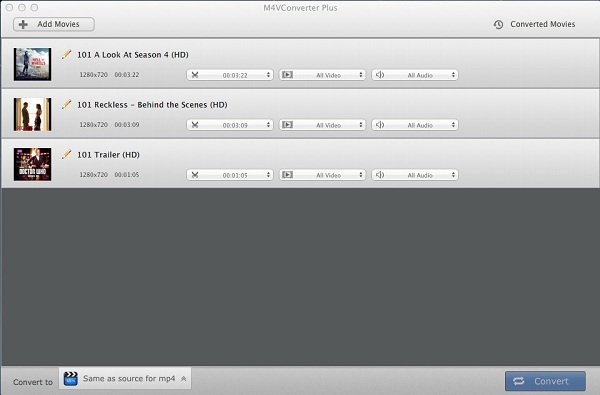 Free download M4V Converter Plus, install and run it on your Mac. Click "Add Movies" button, search your DRM M4V files accordingname, then select the files, click "Add" button. Step 2: Customize output settings. Customize output settings as default, or you can set it by yourself and then select "Same as source for MOV" in the profile. Step 3: Begin converting your DRM M4V files to MOV. 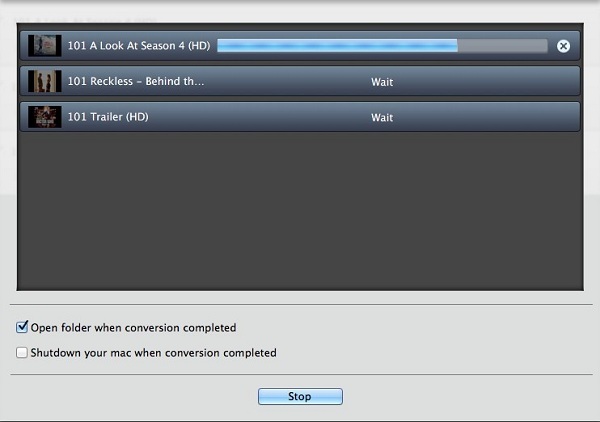 Click "Convert" button or click the menu Control->Start Converting, then the converting process begins. Now, we've finish converting DRM M4V files to MOV within minutes using the powerful M4V Converter - M4V Converter Plus. You can also convert M4V video to MP4, convert DRM M4V to unprotected M4V with satisfied output quality.